Use this single bumper piece to complement your Intake Reversible Bumpers or for a backup or replacement for your reversible bumpers. We proudly offer the super-slick 400 denier nylon fabric in reversible bumper material. Gain an offensive edge with this material, and easily construct reversible bumpers with the pre-sewn fabric (construction video tutorial below) . 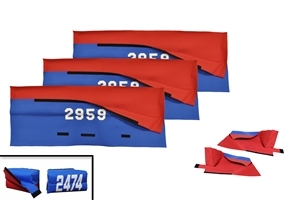 Easily build bumpers with reversible color options. 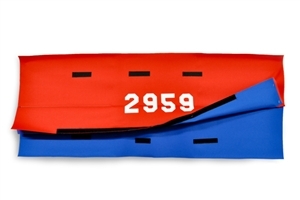 Reversible bumpers save you time by simply folding your bumpers over to whichever color your alliance is that match. See the video below for detailed instructions on how to use this pre-sewn fabric to create your bumpers! This new product includes 3 single pieces of Reversible Bumper Material and Intake Reversible Bumper Material (Right & Left: 1 Set). Robo Promo's new pre-sewn Intake Reversible Bumper Material is made for a 6-inch or 8-inch bumper, and it includes pre-sewn material for both the right and left side of the robot. It solves the problem of finishing the intake area of your reversible bumper. Take the pre-sewn fabric, slip in your noodles and wood, and simply staple it shut. Only three easy cuts to finish the outside corner of the intake bumper; staple it, and your intake bumper is complete. Reversible bumpers are now possible around your entire robot even if it has an opening, and these make it very simple to change colors between matches by simply flipping from one color to the other.